You’re looking at what is the biggest thing to hit snowmobiling since..... the Snowmobile. Introducing the all-new RX-1. The first snowmobile designed specifically around a race-bred, high-performance four-stroke engine with more than 145 hp, the Genesis Extreme. Derived directly from the blistering in-line, 20-valve 998cc four-cylinder found inside our equally revolutionary R1 motorcycle, an award-winning supersport machine without peer. The RX-1’s pulse-racing power and torque, that blows away the competition’s big-bore twins, however, is merely where the fun begins, as every component — engine, chassis, suspension, bodywork — of this incredible machine has been engineered with one goal in mind: raise the level of ultimate snowmobile performance. It was only natural that things should come to this. After all, our ground-breaking four-stroke machines have been dominating motorsports — on asphalt and dirt — for quite some time. And so enters the all-new, standard-shattering RX-1, packing performance so radical and design so innovative, it’s destined to revolutionize snowmobiling as we know it. Yet one thing this extraordinary new four-stroke machine doesn't reinvent is what you expect to see on the scales - it weighs in like an SRX 700 would, if equipped with electric start. 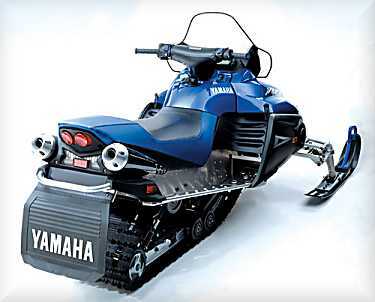 This outstanding accomplishment is proof, again, of the technological might and engineering capability of Yamaha. Nothing else even comes close: From its hellaciously powerful, R1-derived Genesis Extreme engine to its aggressive, all-new Deltabox chassis, independent wishbone front suspension and wind-cheating bodywork, the RX-1 is hands-down the most cutting-edge high-performance snowmobile the industry has ever seen. Available in Team Yamaha Blue/White and Twilight Black. And for a limited time, during Spring 2002... Liquid Silver. New high-performance 998cc 4-stroke engine, based upon the successful R1 motorcycle design, has more than 145 horsepower! It out-performs the legendary SRX in acceleration and top speed. This engine not only has more horsepower than competitor's 800cc twins do… it also develops an incredible 65% more low-end torque. Motorcycle-based 4-stroke engine technology delivers high power-to-weight ratio with exceptional bottom-end power. Exclusive Compact in-line four-cylinder design fits within tunnel width to allow lightweight and strong chassis design. Exclusive 30 degree tipped back engine layout with forward-facing intake, and under-the-seat exhaust, centers the engine mass for quick response to driver's input. Exclusive Patented 5-valve head design allows optimum airflow for high-RPM power and efficient fuel consumption. Lightweight forged pistons operate at a 11.8 to 1 compression ratio on 87-octane fuel. Exclusive Genesis Extreme exhaust system has four straight-out-the-back head pipes that collect through an X-style crossover system to two rear exhaust outlets. This design minimizes exhaust flow restriction for maximum power and efficiency. Exclusive Exhaust silencer position assists vehicle balance for excellent handling. Exclusive Gear-driven output shaft allows high engine RPM and a lower, more efficient drive clutch speed. Rubber dampened isolation system reduces torque pulses for greater clutch and V-belt life. Output shaft also drives water pump and oil pump. Exclusive Four 37mm constant-velocity carburetors have high airflow with easy throttle effort. Industry-leading liquid-heated carburetors maintain excellent throttle response and fuel economy. Exclusive Lightweight and compact 18-pole magneto uses rare-earth flywheel magnet material to generate 425 watts of electrical power. Exclusive Lightweight and strong motorcycle-type engine mounts effectively isolates vibration while maintaining V-belt alignment. Dry-sump oiling system increases engine power and reduces starting effort. Electric starter motor output delivers 1.5 times more cranking power than typical 2-stroke starters with no increase in size due to use of powerful rare-earth magnets. Easier cold weather starting is achieved while reducing weight by 2.8 pounds. Low-maintenance battery develops strong cranking power and saves weight. New aggressive clutch calibration is used due to the Genesis Extreme 4-stroke engine's high-torque and high-horsepower characteristics. New high-force drive clutch weights, working with a new multi-angle helix, generate high belt squeeze force for quick acceleration and responsive back-shift. Camoplast Predator track, featuring 1" lugs, increases acceleration and provides excellent handling. This track is 1.5 pounds lighter than the SRX track. Compact hood shape reduces aerodynamic drag for increased top speed. Exclusive Deltabox chassis has up to 4 times the torsional rigidity than the competition while reducing chassis weight by 9 pounds. This stiff design controls chassis flex for a solid feeling under hard acceleration, quick response when cornering and smooth suspension action in the bumps. Deltabox chassis design incorporates 4 high-strength die-castings produced by an Industry-First high-vacuum high-pressure process. This exclusive method allows lightweight thin-wall construction and increased strength. Force is also carried over the engine to the steering gate with a lightweight aluminum extrusion. Steering linkage, routed to side of engine, allows the engine to be low in the chassis. Engine center of gravity is 0.8" lower and 2.0" further back than the SRX. Motorcycle-style engine mounting system isolates engine vibration, controls drive belt misalignment under torque, and adds chassis strength. Incorporating the heat exchangers under the footrest area increases tunnel strength. New chassis has wide footrests and running board traction for easy driver movement. Double wishbone front suspension moves through 9" of vertical travel with zero bump-steer and no spindle caster angle change for razor-sharp handling and confidence in the bumps. Optimum front suspension travel delivers excellent bump-eating performance with flat high-speed cornering. Double wishbone front suspension design maintains accurate ski-to-ski alignment (zero bump-steer) providing consistent ski tracking in bumps or when riding at high speed. Front suspension geometry maintains the spindle angle at a stable 23 degrees so that steering effort remains consistent throughout the full ski travel. Unequal length A-arm design minimizes ski center-to-center change (ski scrub) for consistent handling on rough, rutted trails. New large 40mm diameter high-pressure shock absorbers increase shock fade resistance. Progressive ratio stabilizer system sharpens cornering and big bump response. New lightweight plastic skis, with dual-angle keel, give accurate steering with low steering effort. Powerful and lightweight electric start feature is standard equipment on all RX-1 models. No more rider overheating from trying to pull-start your snowmobile on cold mornings - no more recoil rope stains on your jacket. Pro-Action SXV long-travel rear suspension soaks up the bumps with 11.5" of vertical travel. This long travel rear suspension delivers performance, confidence and comfort when running through tight corners or through miles of stutter bumps. Equipped with aluminum high-pressure gas shocks with multi-rate springs. New: 40mm diameter high-pressure center shock absorber features new valving design for greater tunability and increased durability and response. Larger oil capacity increases shock-fade resistance. Adjustable rear control rods for increasing or decreasing suspension weight transfer. Exclusive single-point, Quick-Adjust rear suspension allows the rider to quickly adjust both effective shock damping and spring rates to suit their riding style. Standard tunnel protectors and front heat exchanger guard allow for easier after-market track studding. Exclusive LCD digital gauge with super-accurate stepping motor for the tachometer. New: Gauge is backlit for easy night reading. Integrated multiple functions include odometer, tripmeter, self-diagnosis feature, fuel level, hand / thumb warmer settings, low fuel, low oil pressure and high water temperature warning lights. Exclusive 425W magneto system powers new dual headlights for the brightest light in the industry. New: Handlebar mounted controls with industry first Digital-Controlled hand and thumb warmers. LCD gauge easily lets you know the individual hand and thumb warmer settings. New: Easy-pull throttle lever with new shape for shorter pull distance and increased comfort. Lightweight seat with R1-type dual taillight. New: Dual-Piston Hydraulic brake design for lighter weight and efficient cooling. Excellent 4-stroke fuel economy...up to 30% greater than big displacement twins. Save money on operation costs because there's no need to add 2-stroke oil. Low noise levels provide less fatigue for all-day snowmobiling. Exclusive Dual Exhausts do not emit 2-stroke exhaust smell.